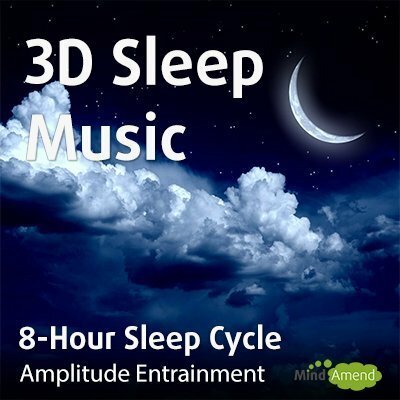 3D sleep music which using sound placement effects to create a soothing rocking sensation, like a baby's cradle or a hammock. In addition to the relaxing music soundtrack, this track also contains isochronic tones and amplitude entrainment modulation effects applied directly to the music. Amplitude modulation involves a process of distorting the sound to produce vibrations, which vibrate in unison with the frequency of the brainwave entrainment session. These vibrations can sound very hypnotic and relaxing, making them very effective and ideal for a sleep track like this one. The music vibrations produce soothing sound, which may be a more appealing alternative than isochronic tones for some people. Note: Put headphones or earphones on to experience the 3D effect. This track can still be used and provide a benefit without headphones. However, to hear and benefit from the full effect of the 3D placement illusion, you will need to use earphones/headphones. As an alternative, you could try listening with external speakers each side of your screen, but earphones/headphones would be better. If you are just listening through the small speaker on the front of a laptop, tablet or phone, the stereo effects from that are probably not going to be strong enough to get the 3D illusion.